It was a busy and noteworthy “A" Shift for Firefighter/Medics of the Prince George’s County Fire/Emergency Medical Services Department for Tuesday, July 11. The County’s Fire/EMS Department is a combination career/volunteer agency that provides services to include fire prevention, fire protection, emergency medical services, and community outreach programs for residents of Prince George’s County, Maryland. It is composed of 45 fire/EMS stations, of which some are all career, all volunteer, or a combination of both. Currently, there are 900 career and civilian employees and 1500 volunteer members. The Department covers a response area of about 500 square miles, protects close to a million people, and has an annual operating budget of 190 million dollars. Last year, the organization responded to approximately 150,000 calls, 80 percent of them were for EMS. At this time, the Prince George’s County Fire/EMS Department is the largest and busiest combination department in the United States. Firefighters arrive on scene of Pontiac Street house fire in Berwyn Heights. At 2:30 pm firefighters from the Berwyn Heights area and surrounding communities were alerted to a house fire in the 6200 block of Pontiac Street. Fire/EMS units arrived to find a 2-story single family home with fire and smoke showing from the top floor. Firefighters initiated an interior attack and search of the structure and ensured all occupants were out of the house. There were 35 personnel on the scene that required about 15 – 20 minutes to extinguish the fire. The cause of the fire is undetermined and fire loss is estimated at $75,000. Five adults and five children are displaced and receiving assistance from the County Office of Emergency Management and the American Red Cross. Two firefighters sustained minor burn injuries. Both were treated at a Burn Unit and released. At about 3:30 pm a parked transport unit was stolen from the patient drop off area at Prince George’s Hospital Center in Cheverly. The crew was inside the Emergency Department tending to their patient when it appears an adult male, a recently discharged patient, stole the unit. The vehicle was tracked by on-board vehicle locater technology and quickly found abandoned at a nearby convenience store in the 6000 block of Arbor Street. Bystanders alerted arriving police officers of a possible suspect that was taken into custody. A review of the on-board camera system confirmed the suspect was the same person behind the wheel. No damage was found and all equipment was accounted for. After decontaminating the unit it was placed back into service. Conditions on arrival at Willow Hill Drive and after fire was extinguished. 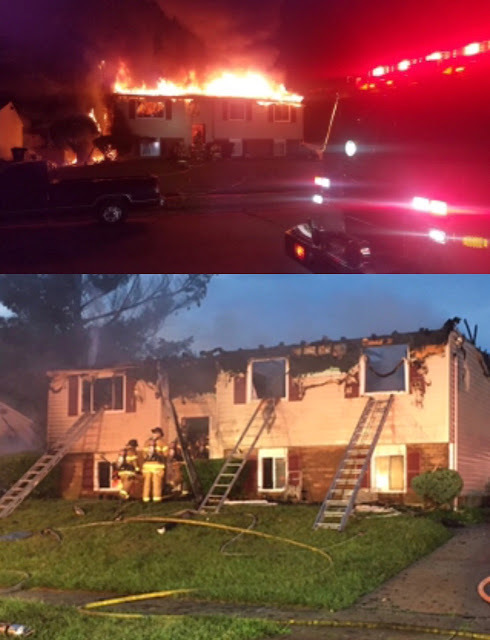 Just after 5:00 am, Wednesday, July 12, “A” shift Firefighters responded to a reported house fire in the 7600 block of Willow Hill Drive in Seat Pleasant. Firefighters arrived to find heavy fire on the top floor and attic area of a 2-story split foyer home. A working smoke alarm alerted the 2 adult occupants of the fire and they were able safely exit the home prior to the Fire Department arrival. At one point firefighters were pulled from the interior of the burning structure and transitioned to an exterior attck before re-entering and ensuring the fire was extinguished. It appears the fire started on the structures exterior before extending into the interior. No injuries were reported. The cause of the fire is undetermined. Fire loss is estimated at $100,000. The 2 adult occupants are displaced and being assisted by the American Red Cross. Prince George’s County residents can have a 10-year smoke alarm installed in their home, free of charge, call 311 and ask about the Departments free smoke alarm program.